Great hotel...awesome breakfast! The staff were super nice & our room was really nice as well. 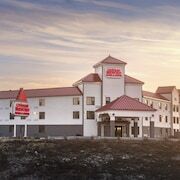 Where to find Mount Uniacke hotels near an airport? Where can I find hotels in Mount Uniacke that are near tourist attractions? Although there is a limited range of short and long-stay lodging options in Mount Uniacke, Expedia's database lists a wide range of alternatives in the vicinity. Within a 0.1-kilometre (0.06-mile) radius of Mount Uniacke visitors can select from at least 57 places to stay. The Halifax Marriott Harbourfront Hotel, Nova Scotia, which is the nearest accommodation, is 35 kilometres (21 miles) from downtown Mount Uniacke. Also, try the Residence Inn by Marriott Halifax Downtown, located in Nova Scotia, which is 35 kilometres (21 miles) away. 35 kilometres (21 miles) from the center of Mount Uniacke, is the Prince George Hotel. Alternatively, the Cambridge Suites Hotel is 35 kilometres (21 miles) away. You could also make a reservation at the Courtyard by Marriott Halifax Downtown or the Inn on the Lake, an Ascend Hotel Collection Member. Looking for more to do? Consider spending a day or two visiting Halifax Citadel and Dalhousie University, which you'll find in Halifax, 35 kilometres (21 miles) to the southeast of Mount Uniacke. 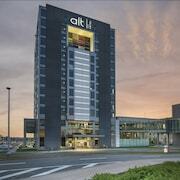 The Delta Hotels by Marriott Halifax and The Halliburton are some of the Expedia-recommended hotel and apartment options in Halifax. 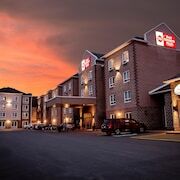 80 kilometres (49 miles) to the southwest of Mount Uniacke, you may also choose to stay at Bridgewater, home to the Best Western Plus Bridgewater Hotel & Convention Centre and Comfort Inn Bridgewater. The DesBrisay Museum and Woodland Gardens are just a couple of the more popular places to see for those visiting Bridgewater. If enjoying sport is your passion, make the time to visit Halifax Metro Centre, which is 35 kilometres (21 miles) to the southeast of Mount Uniacke. Stay right near the action at the Delta Hotels by Marriott Barrington or the The Westin Nova Scotian. Stanfield International Airport is a nearby airport for flying into and leaving Mount Uniacke. It is 25 kilometres (15 miles) drive away. If you plan to stay nearby, try the Holiday Inn Express Halifax Airport or Hilton Garden Inn Halifax Airport. 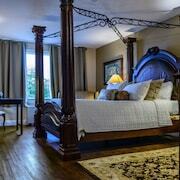 What are the most popular Mount Uniacke hotels? Are there hotels in other cities near Mount Uniacke? What other types of accommodations are available in Mount Uniacke? Explore Mount Uniacke with Expedia.ca’s Travel Guides to find the best flights, cars, holiday packages and more!